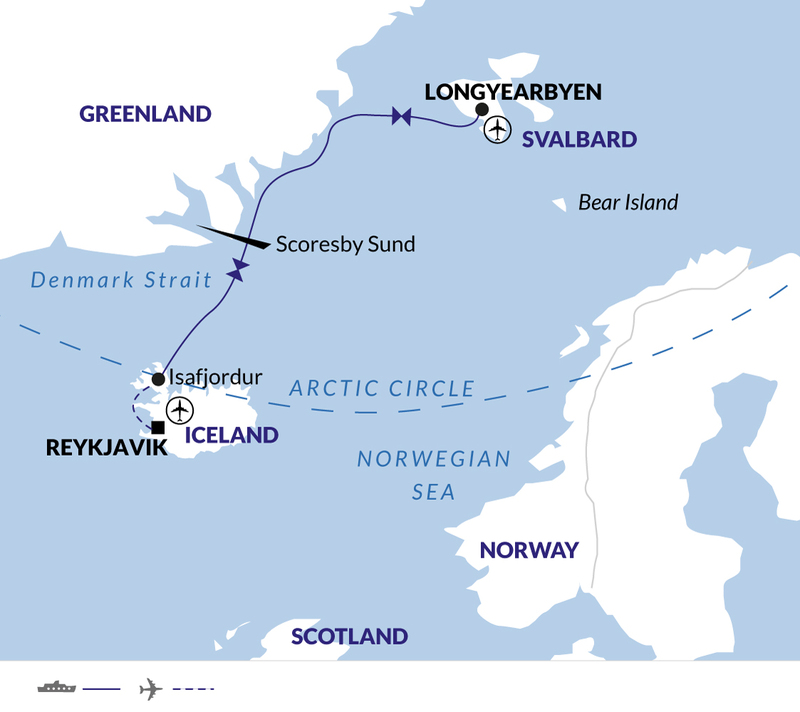 This voyage combines the best of Spitsbergen and Greenland, with a taste of Iceland. Enjoy Spitsbergen's rugged northwest coast which comprises of mountains, tundra and fjords. While crossing the icy waters of the Greenland Sea, our onboard experts will share their knowledge of the region's plants, animals and history, preparing you for your landings. Greenland's remote east coast shows off the immensity of the icecap, fantastic icebergs and a fairytale landscape of granite spires rising 1000 m above exquisite fjords. Enjoy the local culture and look forward to a warm welcome as we visit remote Inuit settlements along the way. Today we will be met at the airport in Longyearbyen and taken on a sightseeing tour to explore the remote outskirts and village of Longyearbyen, the capital of Spitsbergen. After our tour, we will be transferred to the port in the late afternoon and board our ship, the M/V Polar Pioneer. Our voyage commences, cruising out of the beautiful Isfjorden, escorted by gliding fulmars and perhaps the occasional puffin. Depending on conditions, we may cruise either north or south along the west coast of Spitsbergen, in search of the mighty polar bear. Along Spitsbergen's north coast we may explore places such as Woodfjorden and Leifdefjorden, where from our Zodiacs, we can enjoy magnificent views of sweeping glaciers tumbling into the sea. We may walk on smooth raised beach terraces to magnificent viewpoints, hike on flowering tundra where reindeer graze or visit trappers\ huts of yesteryear - all the while remaining alert for wandering polar bears. Arctic fox may be seen patrolling the little auk colony, where several thousand birds nest amongst the boulders - coming and going in huge flocks. This is a beautiful place where we can stretch our legs before heading on a south-westerly course towards the East Greenland pack ice belt. Crossing the Greenland Sea, we sail through the Polar Basin's nutrient-rich waters, searching for fin and beluga whales, encroaching pack ice, and seabirds. Our expert naturalists and guest lecturers entertain us with fascinating, illustrated talks on European Arctic plants and animals and epic tales of early explorers such as Nansen, Andrée and Scoresby. These are relaxed days, wonderful for getting to know fellow expeditioners and preparing for a landing, if conditions permit, in the world's largest national park - Greenland's northeast coast. The region is home to polar bear, walrus, Arctic hare and musk ox. Watch for ringed, bearded, harp and hooded seals from the Zodiacs. Ice is often the overwhelming first impression of Greenland. An ice cap covers 81 per cent of the island and pack ice, even in summer, may fill northern bays. We will attempt to enter Kaiser Franz Josef Fjord, a remote and rarely visited fjord system with countless opportunities for exploration that lies within the North East Greenland National Park. Ashore, cosy trappers' huts beckon from across the tundra, where musk ox, Arctic fox and eider ducks roam. These are just some of the delights found in this area. along the coast of Liverpool Land, with our passage dependent on ice conditions. In Scoresbysund, the world's biggest fjord, the vast Greenland icecap sweeps down in massive glaciers that calve explosively, creating giant icebergs. Sydkap in Scoresby Sund offers good walking and delightful views across the sound. Near Rode Island, our Zodiacs weave through a maze of grounded icebergs, some more than 30-metres high, sculpted with deep green tunnels and aquamarine lakes. These days will be expeditionary days, exploring the East Greenland coast. Much of the region is unchartered territory and depending on weather and timing we'll venture south exploring the bays and fjords, looking for new points of interest and places to land. We will have the morning to explore further before heading into the Denmark Strait mid-afternoon. As we sail across the Denmark Strait towards Iceland, there's time to reflect on our rich experiences, enjoy the flying antics of northern fulmars and black-backed gulls, and spot dolphins, orcas and other whales in their feeding grounds. During the early morning we will arrive into Keflavik. After breakfast, you will be transferred to Reykjavik by coach, with drop-off points at both the airport and downtown hotels. We recommend booking some extra time in Reykjavik at the end of your trip. There will be an optional walking tour available for those who are staying on in the city. The MV Polar Pioneer is a Finnish ex-research vessel, refurbished to provide an adventurous journey in the polar regions; its ice class means it has excellent manoeuvrability. The vessel accommodates only 54 passengers, meaning more time with the experts and a friendly on-board experience. Informed crew and experts will ensure you learn about how a polar expedition runs, your unique surroundings and the wildlife; Zodiacs will take you to shore for close encounters. Onboard the expedition ship you'll find a diversity of international cuisines prepared and catered by professional chefs; all meals are included in the price of your expedition. Dining is casual in one of two dining rooms. There is always a selection of different meals available, and vegetarians will find plenty of options. Special dietary requirements can be accommodated with advance notice, please advise us at time of confirmation. Coffee, tea and water are all provided free of charge. All other beverages, alcoholic and non-alcoholic, are not included and can be purchased in the bar.